9 Gorgeous, Colourful Bathrooms Perfect For Your Home! 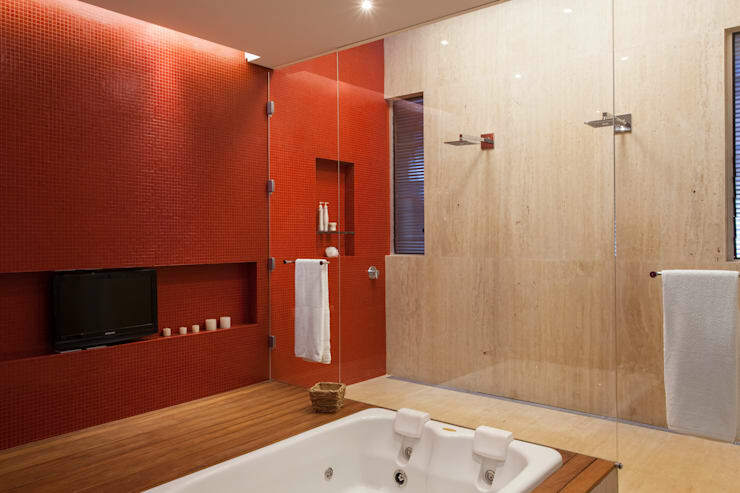 Bathrooms are often a place of solace and relaxation, with neutral colours and simple décor. However, in this Ideabook we show you that not only can your bathroom be vibrant in colour, but it can also look amazing, unique and filled with personal charm and character. By adding some bright and warm colours to your bathroom you can boost illumination and tranquillity, while also creating a bathroom that suits certain people in the home, especially children. So go on and make your bathroom daring and beautiful! This gorgeous bathroom is a combination of neutral tones with white features. It’s not as daring as some of the bathroom designs you are yet to see, but it is great for personalities that would like an unusual and modern take on the old style. It shows some colourful accents only on one wall of the bathroom, but it's a good start. 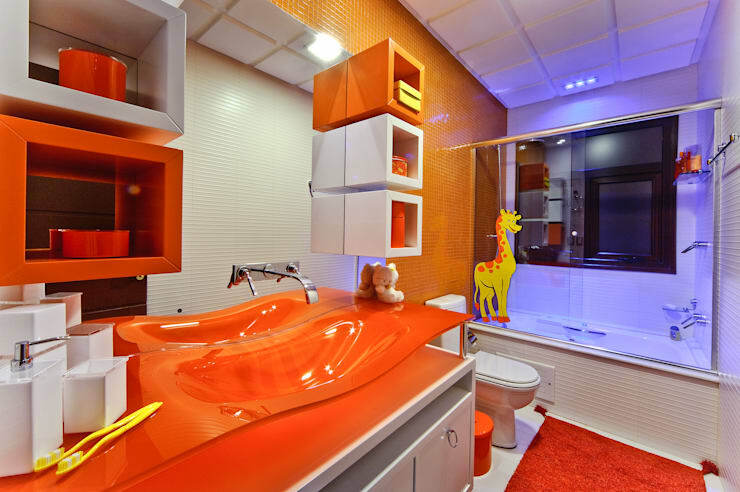 This orange bathroom is without a doubt eye catching and the interior designers were sure that it would make for a brilliant bathroom, especially for a child. The modern style is blended with white fixtures and orange accessories, while the illumination enhances the colourful space entirely. The space can be easily converted to suit an adolescent or teenager eventually too. A small bathroom doesn’t have to be boring. 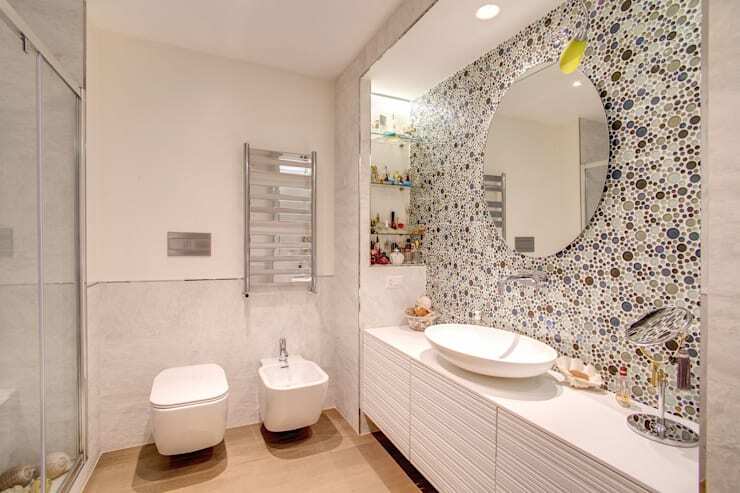 This eye-catching and brightly coloured bathroom has the perfect décor to make a lasting impact on visitors. 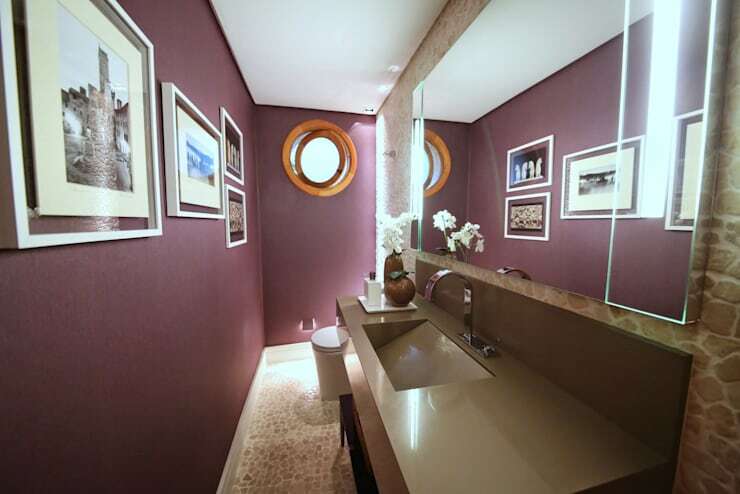 The walls are a mix of pink and other colourful motifs, this bathroom will definitely make an impression. This warm and cosy colour makes the perfect addition for a home surrounded by nature. It’s elegant and minimalist with an accented wall in ochre. The combination of other neutral shades within this bathroom, along with the modern lighting creates the perfect space to unwind in the bath tub. 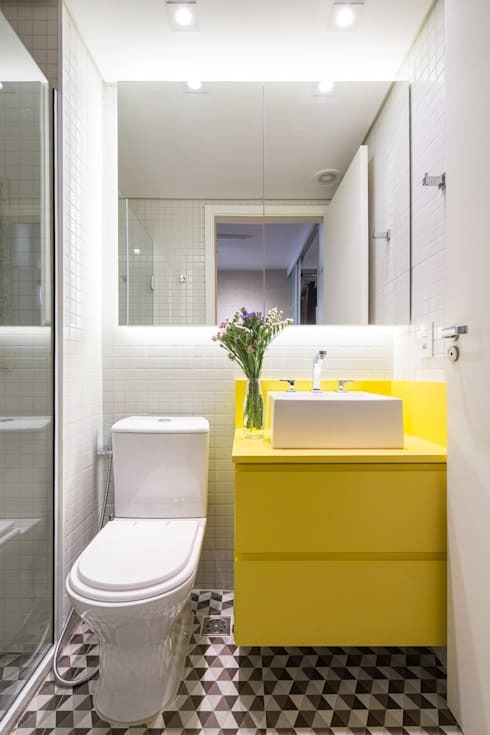 Some very tiny bathrooms unfortunately do not have windows to allow the sunshine in, but that doesn’t mean you cannot create a sunlit illusion… this bathroom includes an adorable bright yellow cabinet that lets the sun shine. A cooler colour in the bathroom can be elegant, subtle and simple too. These purple walls have been perfectly coated to be sophisticated, chic and so stylish. 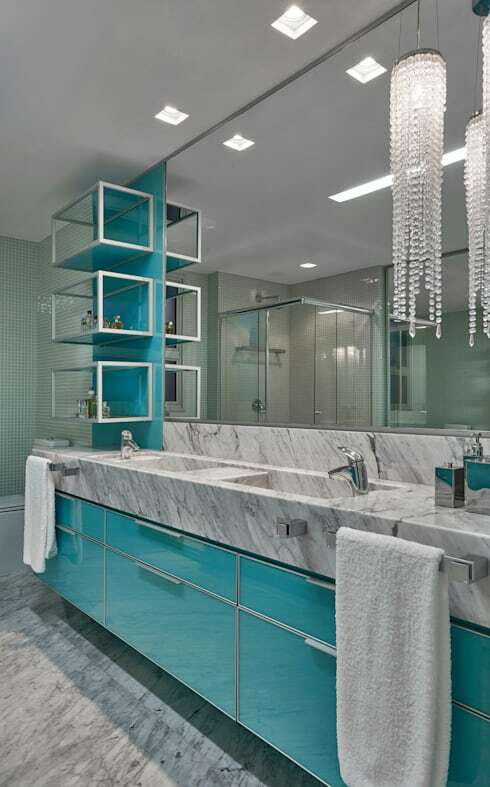 The colour is enhanced by the stoned floor, large mirror and modern countertop. It’s harmonious and pleasant without a fuss. 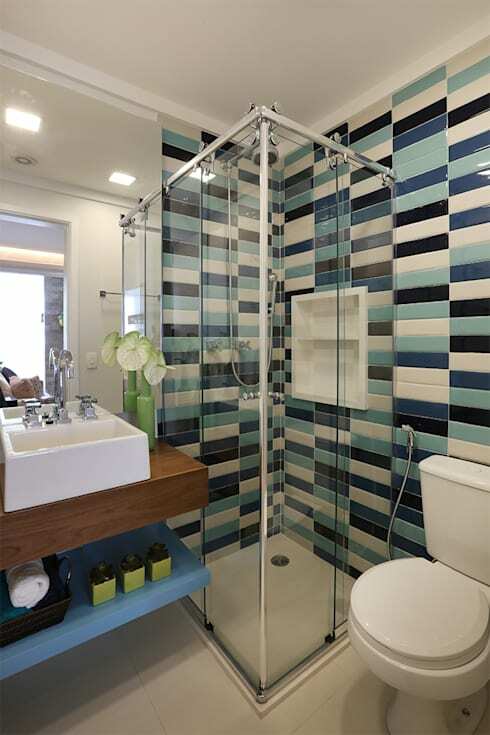 This blue bathroom has a tranquil and comfortable atmosphere that exudes cleanliness and comfort. The calming ambiance in enhanced by the marble countertop top, large mirror and perfect illumination. It’s simply serene. Although it is a lot less stimulating and eye-catching then its red counterpart, a pink bathroom has a definite femininity and style that makes it pleasant and fresh. 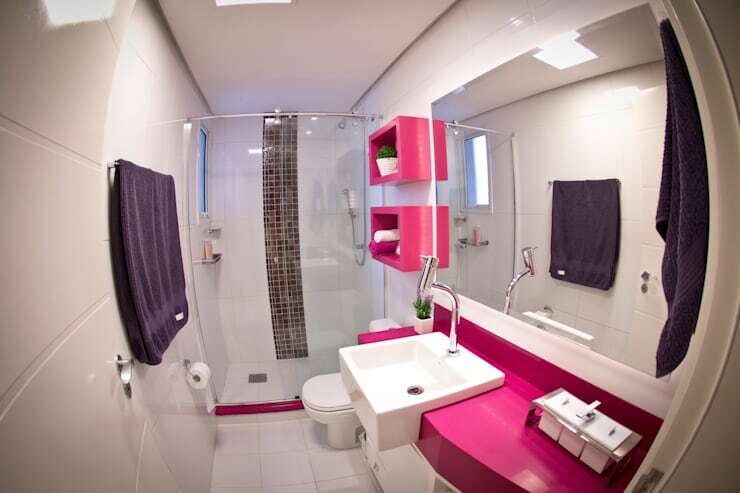 This pink, white and magenta bathroom is a great option for those who thrive on creativity and eclectic style. We have reached the end of this Ideabook, but we are yet to view a bathroom of geometric patterns and design. This striped bathroom is elegant and attractive, the mix of light and dark blue, white, grey and black create a fantastic yet edgy bathroom that is modern and trendy. Now consider these: Perfect Washing Machine Storage Ideas. Which colourful bathroom would you include in your home?